Join or contribute to Rochester’s cultural open mic – The next event will be at the Dot Cafe in Rochester on the 29th May. Poetry, philosophy, music, short-stories, painting, plays, history, short-films, photography, stand-up comedy and anything else, are all welcome. The organisers are particularly interested in hearing from visual artists who would be interested in experimenting with creating live art during a 10 minute spot. Seasonally Effected will give 5-10 minute spots to anyone who would like to respond to join in. There is a vague theme of right now, relating, however tangentially to the time of the event. Book soon, as places are limited. 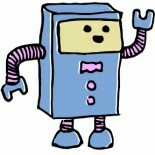 This entry was posted on 20/05/2013 by Creatabot in Creative and Art Events.